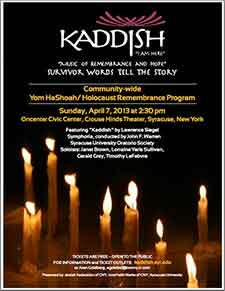 Telling in music the stories of some who survived the Holocaust, Lawrence Siegel's Kaddish reverberates on many levels, resonating with themes of history, family, storytelling, and the perpetual fragility of human rights in the face of inexplicable evil. Here I Am... And Look Who Is With Me is a study guide for Lawrence Siegel's Kaddish. This program offers arts-based lessons based on five movements from the composition. Available on demand. Contact manager@kaddishproject.net. The Litany/Kaddish Prayer CD-ROM contains the score of those two movements, along with information for performers and recordings from the world premiere performance. For further details email manager@kaddishproject.net.